It was lovely to go and spend a morning with Jonathan in his Peckham based studio. Having lived near the area in the past I enjoyed seeing it in a new light, from somebody else’s perspective. Jonathan is a very friendly designer and gives me a warm welcome into his work space. As I went early in the morning the space was peaceful and quiet but I could imagine the energy that you might find there on a weekend when screen print hobbyists find the time to pursue their passion. Jonathan’s story is one of great satisfaction, working hard for many years to get to the point where he is able to solely work on his art.. A dream for so many and a reality for so few. With the large following he’s gathered, Jonathan can suddenly pick up work from all over the world at any given time. An incredible situation to be in, with his bread and butter coming from large commercial work with Tektura. Let me start by asking you what were your creative influences as a child, as we know this can very much impact where we are now and the career choices we make in the future…Was there someone influential in your life? 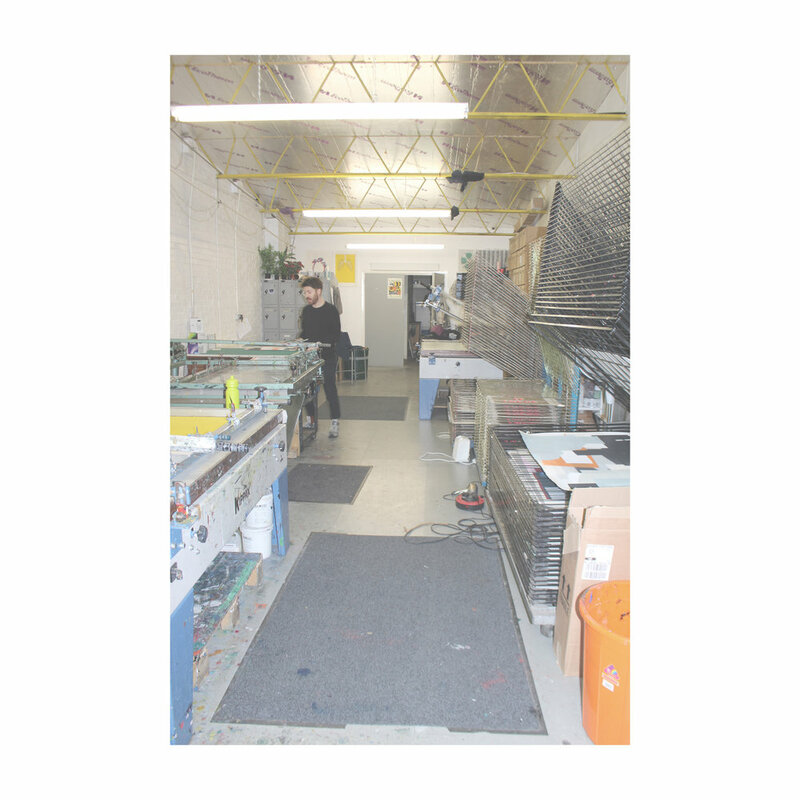 So tell me when was your first experiences of screen printing? Screen printing was with this new art teacher, but it wasn’t with water based inks, it was with oil based inks which is a nightmare, hence why they don’t do it anymore. When you clean it you have to do it with white spirit; I remember her leaving me to clean up and then she came back about 20 minutes later and I had nearly passed out from the scent! 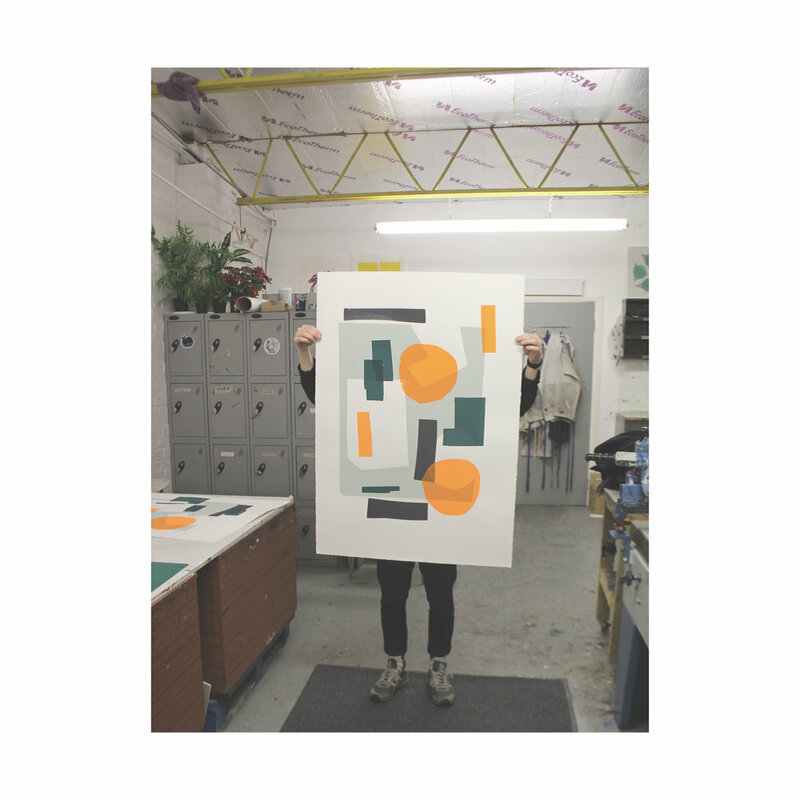 I then continued at bournemouth, where I did my art foundation, and then at Leeds without really knowing I kind of ended up on a course which was basically just screen printing. Was there a turning point when you decided to be an Independent artist and pursue it solely as a career? So I was in Berlin and I had been doing it here-and-there but then I kind of got fed up of all these little jobs on the side, and to be honest emotionally I just couldn’t take it anymore, so in one fell swoop I decided to give that up and just go with it, and so far so good! It was 2017. It was a very big jump, and it was quite panicky! Congratulations! That really is amazing. So what is it that inspires you, and what drives your work? I mean I always get asked what inspires me, and I always find it really difficult to answer because it’s basically everything, I can’t say it’s one specific thing. I just do stuff that I like and I am lucky enough that other people like it as well. If they didn’t I would still do it! It just seems to come naturally, there's not one special thing that inspired me. I just love the process. The creative process can have its ups and downs. How would you say your the your work affects your mood? I mean, I get a massive amount of enjoyment from doing it, but yes, it’s very up and down. Even with these prints I am doing now, with so many layers, you could start with something very nice, you could then put a new layer down and hate it, but then you can add more layers which makes you like it again! With the process that I use, it’s really important to know when to stop or when to add that little bit more, it’s quite a delicate balance… so you do go through ups and downs. What advice do you have for Graduates coming out of design school now who would like to follow in your footsteps? Well, I graduated 10 years ago now. So, although i’m not saying it takes that long, it is a lot of hard work. I think most people who come into this studio realise how hard I work. If I’m here from 10-5 its very rare I stop the whole time. I’ll be on my feet all day. 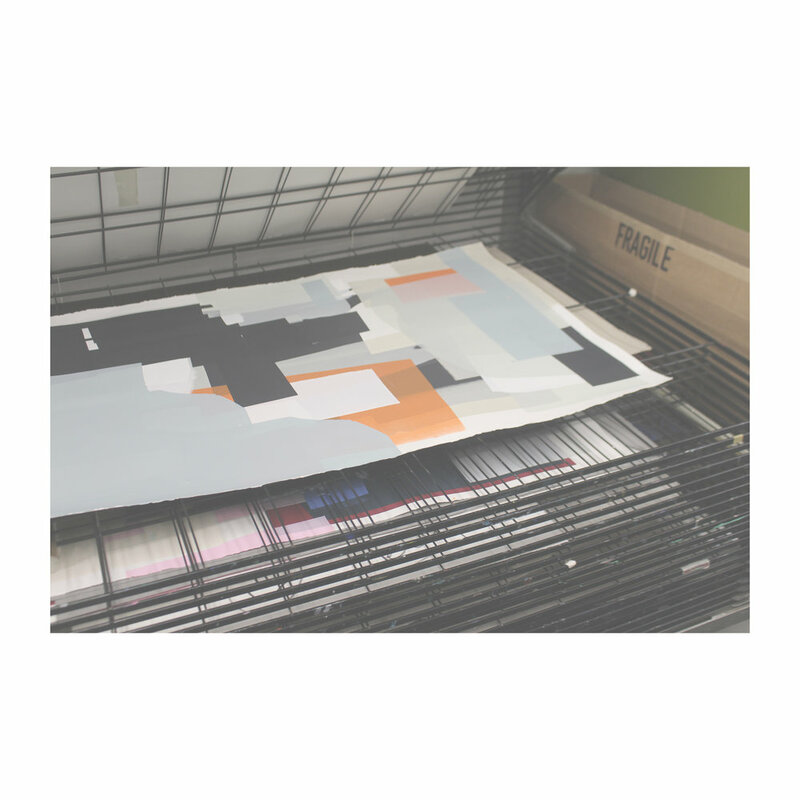 Also with traditional screen printing you can plan it in advance, but lots of my stuff happens on the print bed so i am not only physically working but also mentally thinking things through. So in terms of advice… Keep going! You have to work very very hard, most definitely! What's the biggest struggles day to day? What are the moments that you find difficult? I mean screen printing is physical labour, so sometimes, being on your feet working, especially with some slight back issues I have. Doing this thing full time is emotionally stressful. it’s also really difficult to do work that you like but also that other people like. Doing commissions I find quite stressful because no matter how much i might like it it also depends on the client. I do like to involve them but not too much as they have to trust me as the artist. In terms of self-motivation, are there some days where you just think - ‘I can’t do this!’ And how do you turn that around? Im really really useless at relaxing anyway! So I am on it all the time unfortunately! My best days are actually when I am really busy. If I take a day off and sit on the sofa or sleep in I will enjoy it to begin with but by the end of it I’ll be thinking about what I could have done. Relaxing is something I need to learn because with physical work you do need to take time out. My best days are busy days for sure! Also, when you’re not working, you’re not getting paid basically! And of course things can happen from all over the world, so you’ll be sat at home and you can be in contact with someone from the east coast of America so it’s hard to just sit and watch the tv without looking at your phone for an email! Talk us through an average week in the life of Jonathan Lawes. Ooh, so on an average week, most of my time is spent here. Weekends are kept for me and my girlfriend. When I used to work in cafes and bars that was weekend work so now I like to enjoy weekends, so now we have those two days together. I mean I will still come in if I have to package up an order but I don’t really come into the studio at the weekend; it’s usually the busiest time because of people who work monday-friday elsewhere need to use it then. When I’m not here I’m having a coffee somewhere else but still thinking about work! 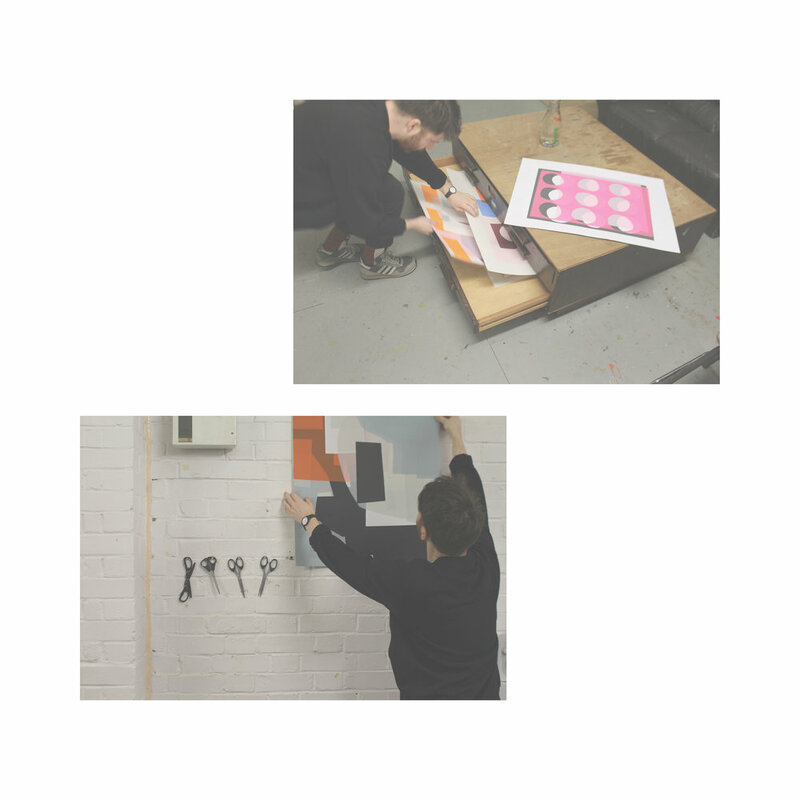 So going onto your work, tell us about the materials and processes involved in screen printing in the work that you do. So screen printing as a process is basically for mass production so you can make a perfect stencil on a screen and then repeat it again and again. The whole process of exposure with emulsion takes rather a lot time and it doesn’t really suit the way I print, so I print with a blank screen and make my own stencil which speeds up the process. Once you’ve washed the screen you can sit around and wait for it do dry, but when I'm in the zone I get the hair dryer and dry the screen to try and limit the amount of time in-between and to keep the flow going. This sometimes goes straight from 10-5 and then I realise “Oh my god, i need to sit down!”. I use water soluble inks which are easy to clean, but you need to be careful not to get drops of water on your work. The work I’m doing at the moment is quite forgiving and I’ve started to do more experimental prints, working with textures and layering. It’s still clean cut to an extent but it’s more embracing the side of screen printing that you don’t usually see. With this lovely studio you work in, there’s not anyone here now but I am wondering if there is a sense of community here & is it a nice place to work? Most definitely! There’s a lot of space for everyone to work and it’s really nice to see different people’s styles. Just yesterday I was doing very abstract experimental stuff and there was another person doing CMYK which is 4 layers which make a photograph like print and there was another guy doing some posters in neon colours. So it was like 3 different types of work, so you can definitely get inspiration from those around you. I mean I am kind of at the stage where I would love my own studio, but at the same time I would miss the interaction. Let’s talk Tektura! How did that come about & tell us about the work that you do for them? When I finished uni I did an internship in Amsterdam and while I was there I got the contact for a company called BN Wall coverings which is the sister company of Tektura, which I didn’t know at the time. I contacted BN and they said they weren’t looking for anybody to do any designs for them but maybe I should contact Tektura which was based in London, so I did that and I’ve been working for them on a freelance basis for nearly 9 years. You can find it all on their website but most of it is sold through a sales team around europe. That work is all digital, but I take ideas from my screen prints and work them into the digital format and vectorise everything and so that it can go to any size and custom colours. Who would be a dream client? Pick anyone, any brand any size! I’ve always really really wanted to work for Marimekko. I think their prints are amazing, I feel i could adapt my style to work that way. Also to do something with IKEA would be pretty cool! Anyone who’s listening... Contact me! What does the future hold for Jonathan Lawes? This year I have been focusing on working on a bigger scale. I also want to look into printing on something else.. Maybe canvas rather than paper… maybe printing on wood. But also collaborations, similar to what I do with Tektura, but with my work on interior furnishings rather than walls. 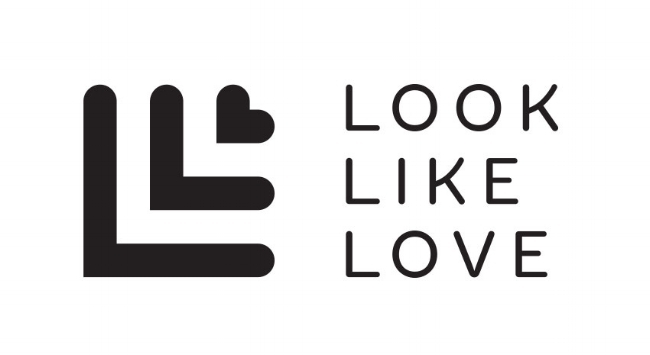 I noticed at our Look Like Love Pop-up last year that you bought a few of the other designers’ pieces. Is supporting other independent designer-makers something you are passionate about? I am a sucker for that! I’ve got a whole portfolio of prints from other people and I’m a massive fan of ceramics - I buy a LOT of ceramics! I was at a market a couple of weeks ago that had a ceramics section and I had to really contain myself so as to not spend all my money! I love buying independent stuff from little quirky shops. I also recently bought a painting by Anna Mac, she’s a really talented woman and I really like her work.